Welcome to part three of Rebuilding Gornik Zabrze. If you missed the previous post, do go and check it out by clicking this link. 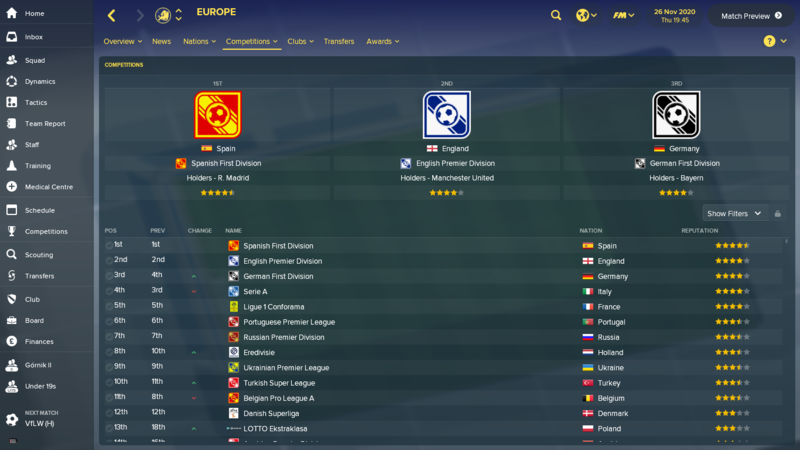 In this post, we will review our third season with the Polish club. Let’s get started.After a much-improved league finish last time out, the board once again asked me to finish in the top half of the table, otherwise known as the Championship group. However I had set myself the goal of finishing in one the Europa League spots in Poland. We are predicted to finish 6th this season and are 50-1 to win the LOTTO Ekstraklasa. As you know after winning the Polish FA Cup last season we go into the Euro Cup second qualifying round. 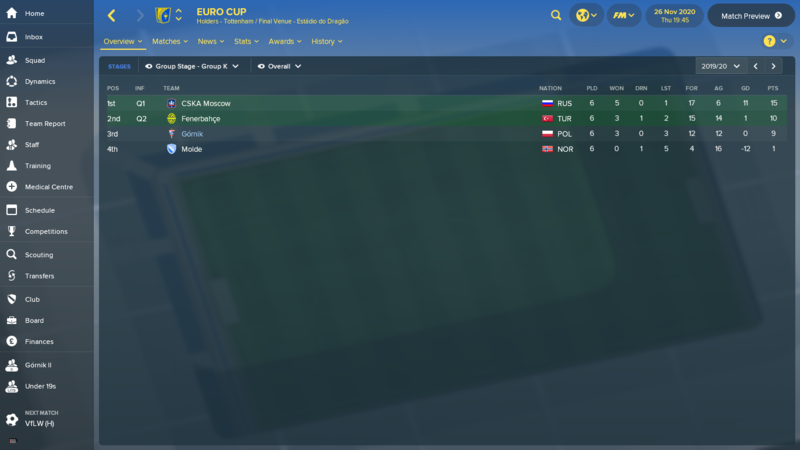 My honest aim for this was to qualify for the Euro League proper or the group stage as commonly known, but I knew that this may even be a stretch too far for my Gornik Zabrze side. As for the Polish FA Cup itself, I am hoping to win it again this year as I know it may be our best chance to once again try and qualify for some form of European football! As I mentioned in Part 2 of my blog series, we are in a dire situation when it comes to our finances. This, therefore, meant that I was unable to bring any players in at all this season – the fact was that I had to sell players just to keep the club afloat. Our biggest departure was back up centre-half Dani Suárez who left the club for 300k. Midfielder Konrad Nowak followed suit but for only £19.5k. 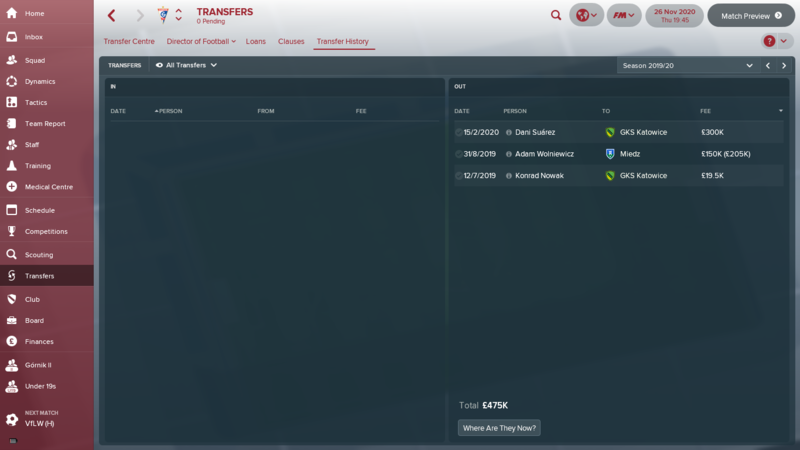 Lastly, and this was the worst of our departures, was right-back Adam Wolniewicz who left for £150k. I tried to reject as many offers as possible for him but in the end the Bartosz Sarnowksi thought that this offer from Miedz was too good to refuse. So to have any chance of bolstering our line-up this season I had to wait for the youth intake day, and I tell you what we have been very lucky this year. Some of our future stars include striker Patryk Majewski and defensive midfielder Dawid Semeniuk, but the pick of the bunch was definitely midfielder Jacek Adamus who, at just 16 years of age, is already playing in the Gornik Zabrze first team. I will start with the Europa League, I am extremely proud and somewhat surprised to say that we actually qualified for the group stage. First, we had to make our way past Norweigan side Strømsgodset in the second qualifying round. Next up came Dutch side Vitesse who we comfortably beat and lastly was another Dutch side in the form of FC Twente who we only just squeezed past on away goals. So in the group stage, we were drawn against Turkish giants Fenerbahçe who unfortunately did the double over us. Then came Norweigan side Molde who we did the double over which I was very pleased about. Last, but certainly not least, came Russian goliaths CSKA Moscow. In the end we finished third in our group, only behind Fenerbahçe by one measly point and unfortunately we didn’t progress but it certainly gave our side the big financial boost that we needed. In the Polish FA Cup we were knocked out in the second round by lower division side Olimpia Grudziadz, this was similar to how we fared in the first season as Gornik Zabrze boss. It seems that we either win the whole thing or get knocked out in the first game! However, one competition we did win was the Polish Super Cup. A goal from Szymon Zurkowski helped us win 1-0 over league champions Lechia Gdańsk. This will certainly help improve our reputation not only within Poland but across the whole of Europe, potentially attracting some better players to the club. Speaking of Lechia Gdańsk they were once again crowned league champions by a whole 18 points, but guess who finished second and qualified for the Europa League second qualifying round? Correct, it was Gornik Zabrze who finished on a record number of points achieved in a season and that was 73! Once again we were the winners of the LOTTO Ekstraklasa fair play award, this award is given to the team with the least yellow and red cards throughout the season. Michal Koj and Sandi Arcon were selected in the LOTTO Ekstraklasa team of the season with Marcin Wasielewski and Marek Antkowiak selected amongst the substitutes. Fans player of the season was voted as Szymon Zurkowski, but once again I have to disagree with this because Marek Antkowiak really impressed me again this season and even earned his 1st cap for the Polish senior side. This happened last season where Marek was totally ignored by the fans, I assume it may be because teams such as Arsenal and A.C. Milan are in a race to sign the Polish youngster. Now, this isn’t much of an award but on a side note I was offered the Lech Poznan job about halfway through the season. Obviously, I declined this as this is ‘Rebuilding Gornik Zabrze’ and I am loyal to the Trójkolorowi, but I think it just shows that am I overachieving with this side and I am very proud of my achievements. Finally, the LOTTO Ekstraklasa has moved from 18th to 13th in the European competition rankings, this is a big jump up from 21st first where the league originally started. 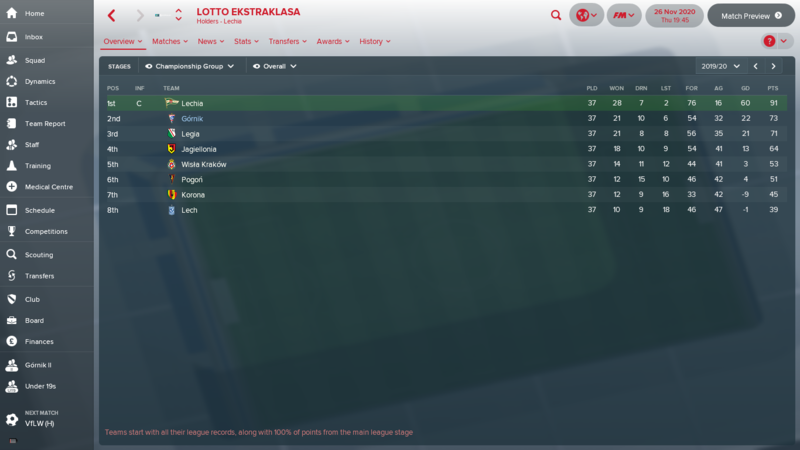 As a result of this Poland have gained an additional Champions Cup place for the 2021/22 season, so I would say my initial goal of increasing the reputation of Polish football is certainly well on its way to being completed. So that’s it for Part 3 of my Rebuilding Gornik Zabrze save in Football Manager 2018. I hope that you enjoyed my blog and if you have any suggestions either for transfers or even how to improve this FM18 blog please either comment below to head over to my Twitter @Casual_FM_. Once again thank you for taking the time to read this blog! This entry was posted in FM18 Stories, Football Manager 2018, Gornik Zabrze | @CasualFM and tagged europa league, fm stories, fm18, football manager, Gornik Zabrze | @CasualFM, poland, polish ekstraklasa. Bookmark the permalink.